The kind of thermometer known as an “instant-read” delivers a temperature reading of foods within a matter of seconds. It’s indispensable to any serious cook for taking the temperature of everything from water for proofing yeast to bubbling syrup to a steak on the grill. 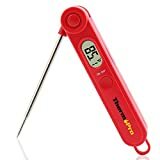 ThermoWorks cooking thermometers are top-of-the-line thermometers that deliver accurate results, in Celsius or Fahrenheit, in only 3 seconds. Professional cooks will appreciate a thermometer so sensitive that can give the temperature of an ice bath to within 1 degree and an option to have temperatures given to within tenths of a degree. Home cooks and pros alike will enjoy the Thermapen’s backlit digital screen and the thermometer’s ease of use. The Thermapen Mk4 turns on automatically when the probe is unfolded, and turns off again when folded. It can be customized with a digital “sleep mode” that will turn off the thermometer after a set period, and turn it on again when any motion is detected. Available in a choice of ten colors, it is waterproof, can be used right or left-handed, and its AAA battery will last for 3,000 hours. Its only drawback is that, because it is waterproof, it can’t be switched between Celsius and Fahrenheit without opening the device with a small screwdriver to change the setting. For most home cooks, that won’t be a problem. Professional cooks and recipe testers will love the Thermapen Mk4, but might want to have a ThermoWorks ChefAlarm as well. 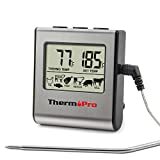 The ThermoWorks ChefAlarm is one of a line of Pro-Series temperature probes suitable for commercial use, but would be a nice addition to the kitchen of any serious cook. It comes equipped with timer, probe with long cable, a clip to hold the probe in a pot, and a laminated temperature guide, all in a sturdy well-designed zippered case. The ChefAlarm is designed to allow the probe to be left in foods during cooking. Insert the probe into a roast in the oven or in a boiling pot of sugar syrup, connect its cable to the alarm on the counter (away from the heat), and set the desired temperature. Settings include high and low-volume alarms and timers that can count down or up as desired. Best of all, buttons on the back allow it to switch very easily from Celsius to Fahrenheit.